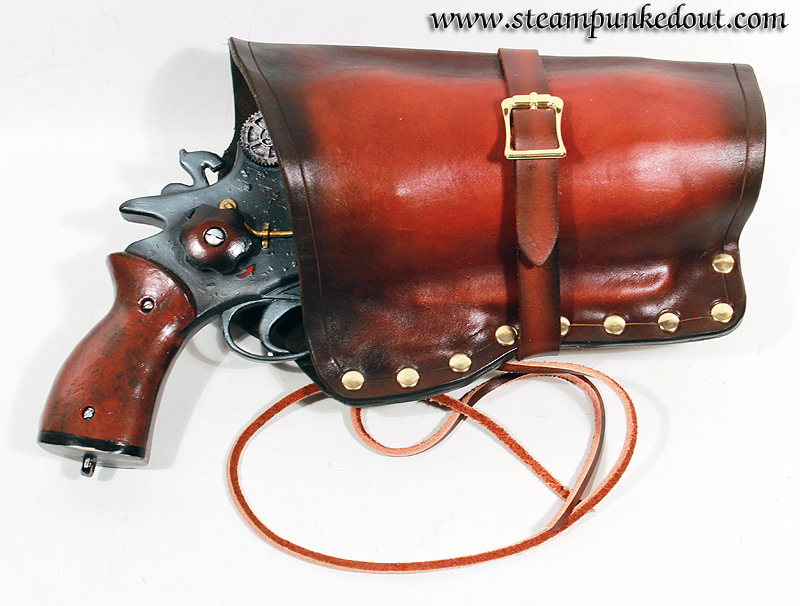 I get a lot of requests for custom holsters. 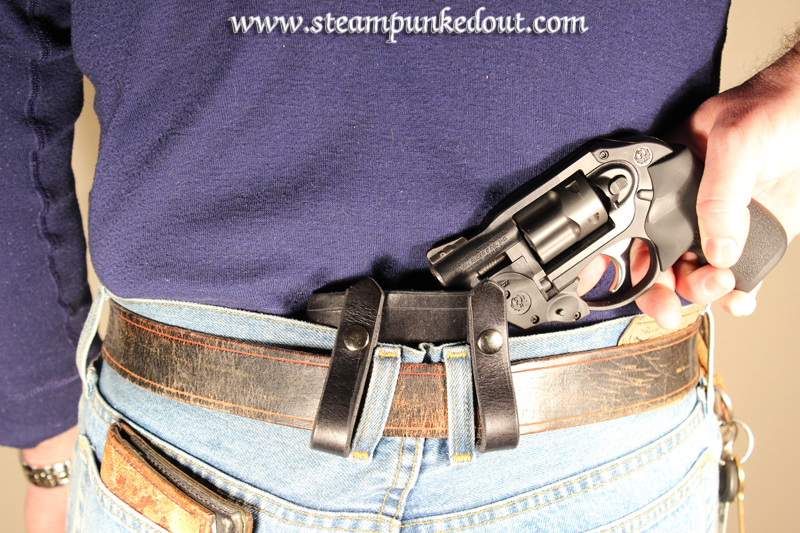 Now it's easy to get the ball rolling on a holster built just for your gun! Once I receive an order for an estimate, I will reply to the email address provided and request the gun info. Once we have agreed on a design and price, I will begin the holster and an invoice for the estimated holster price will be email via PayPal. 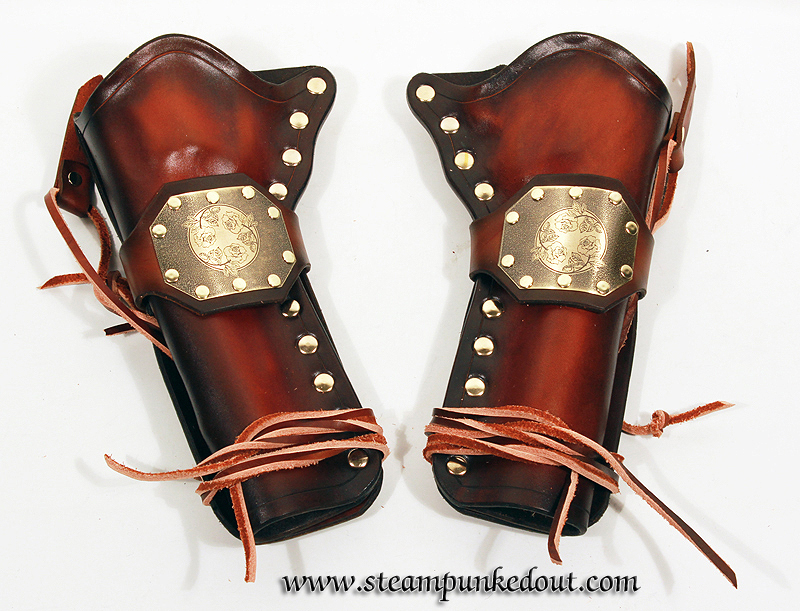 The amount paid for the estimate ($15) will be applied to the final cost of the holster. 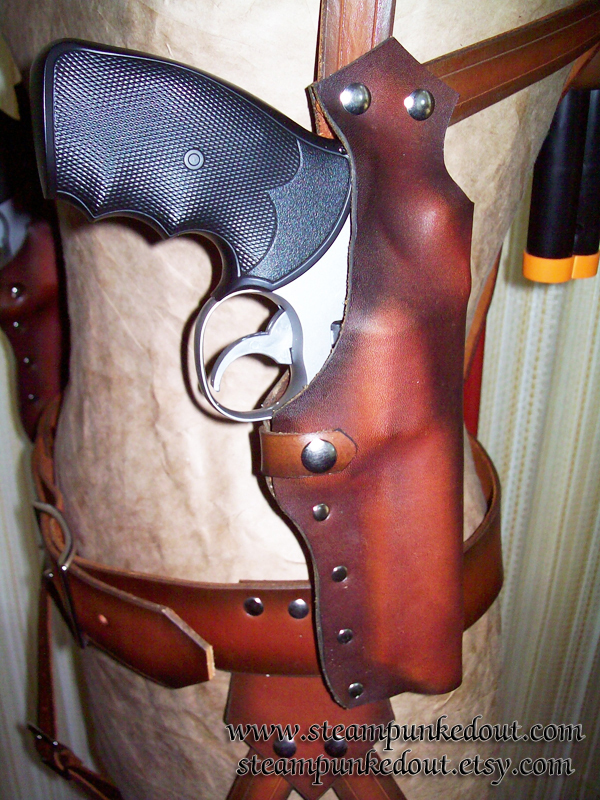 Sorry, there will be no refunds for estimates if a agreement cannot be reached for a final holster design. 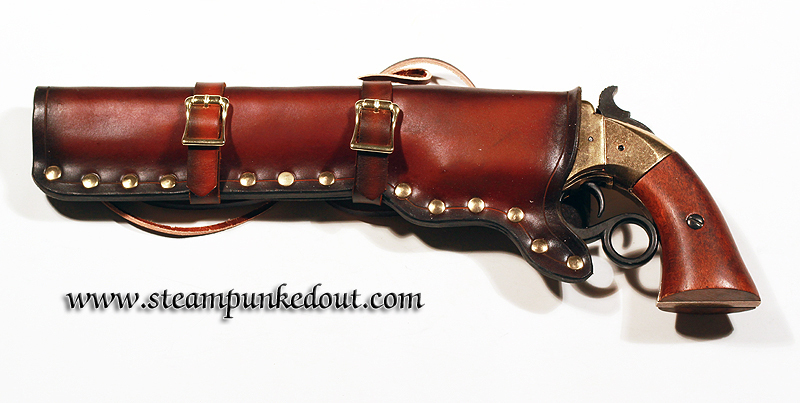 If you have a real weapon to have a holster made for, please DO NOT send it to us. 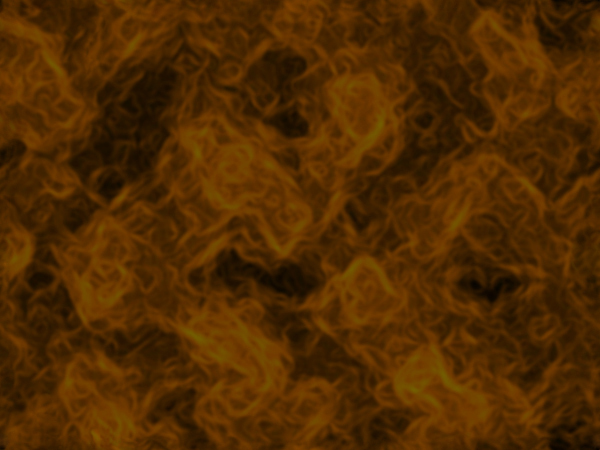 Once I have the exact make and model, and I will work with my local gun shop to acquire one locally to make a pattern. If this is not a possibility, we can discuss alternative options. 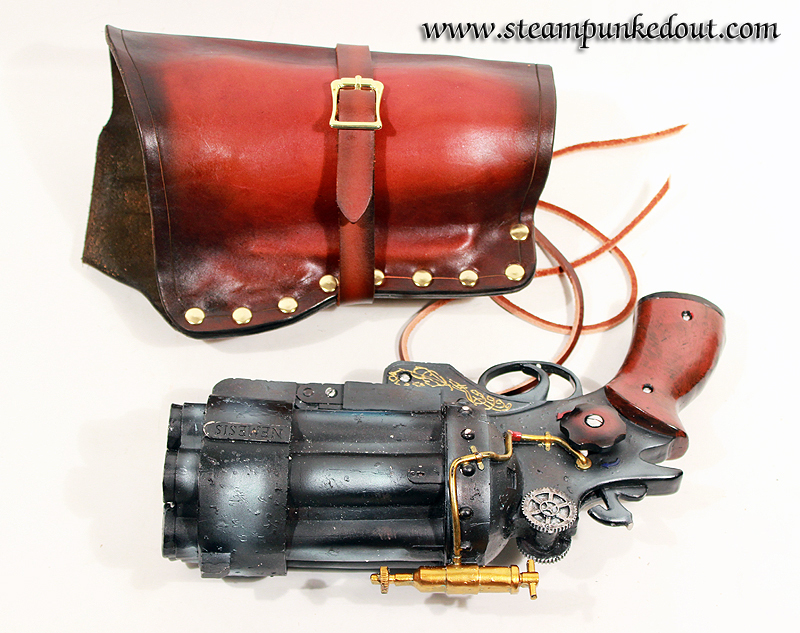 Steampunked Out has been working with a local gun shop for several months to produce quality leather holsters for their customers. We've made concealed carry holsters for compact Ruger and S&W, western styled open carry holsters for Ruger Vaquero revolver, custom cross draw holster and belt for a 45/70 BFR, and more; and our customers were thrilled with the final products. Most average sized handgun holsters are running about $100. Larger guns (like a BFR) can be much more expensive depending on the material used and final design. Smaller holsters (like cobra derringers) can be as little as $50-75. 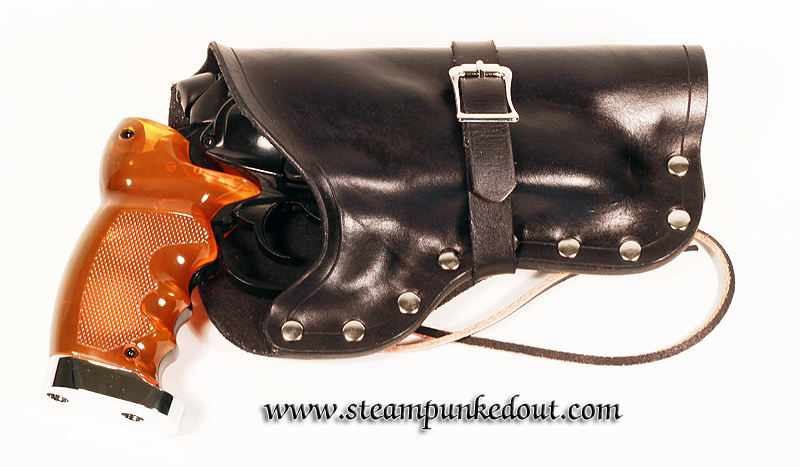 We've also done several holsters for air soft pistols. 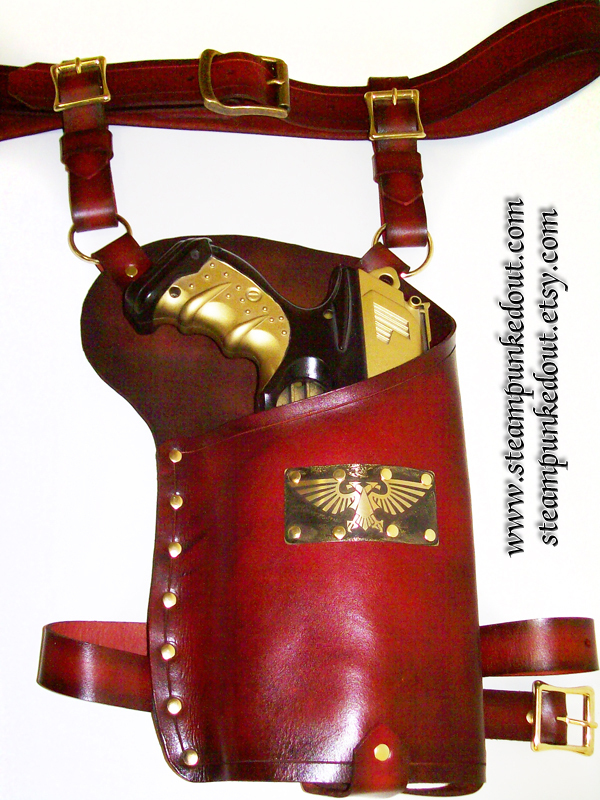 Custom shoulder holster rigs, western holsters, and fantasy/sci-fi setups; we can do it. 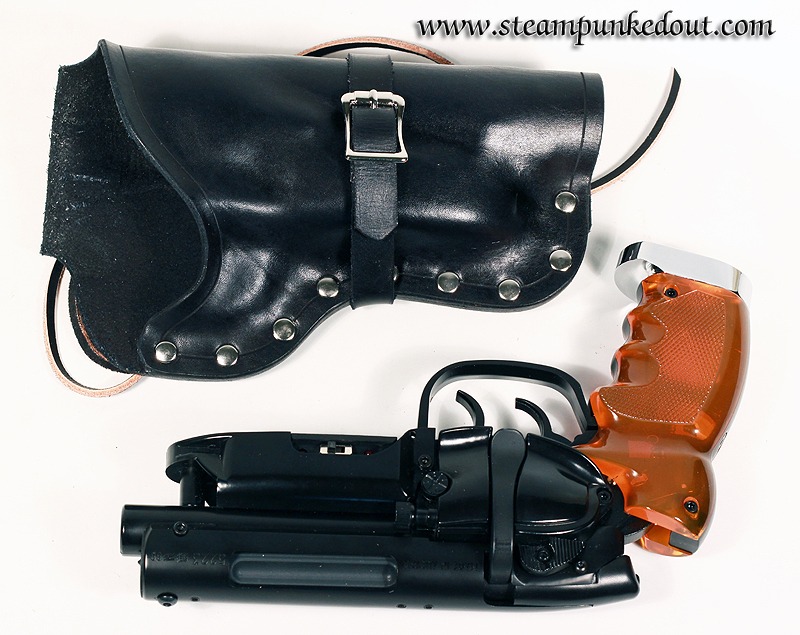 For replicas, airsofts, and toy guns, the best way to have a custom holster made is to send the gun to the shop. If sending the gun to the shop is not possible, please do not purchase the estimate. 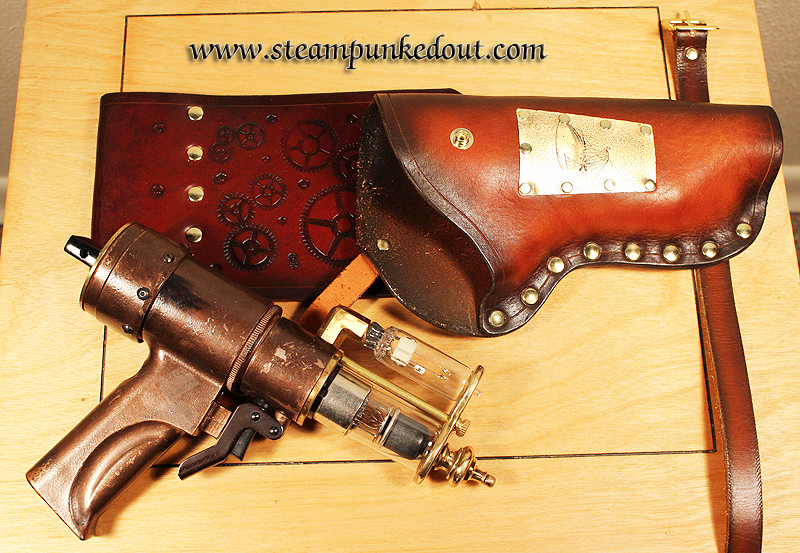 Due to the unique shapes of most sci-fi guns, it's nearly impossible to guarantee a good fit without the gun in the shop during fabrication. 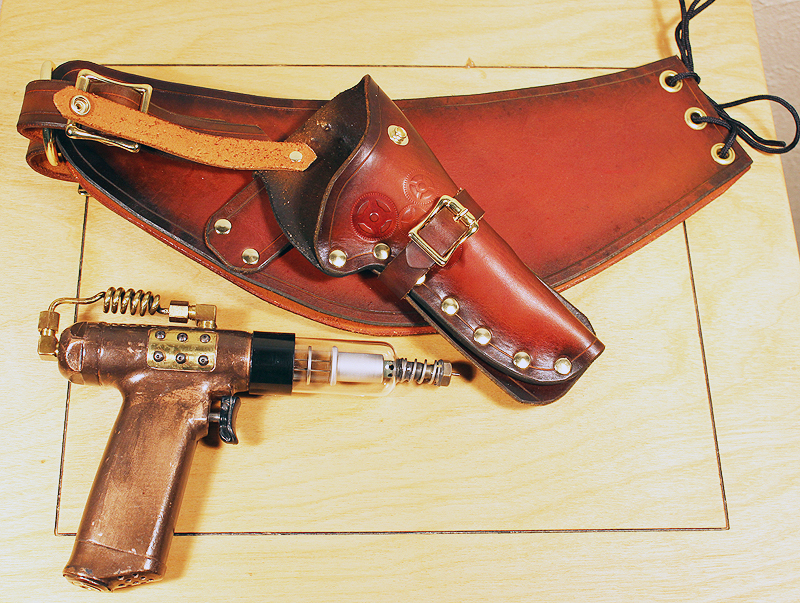 It's very difficult to ballpark a price for sci-fi holsters. Airsofts and toys that simulate standard sized handguns will be similar in price, currently $75-85. Larger weapons like Nerf guns or resin cast pistols can vary wildly, but are usually $100 and up. Custom shoulder rigs and belt systems increase the cost as well. 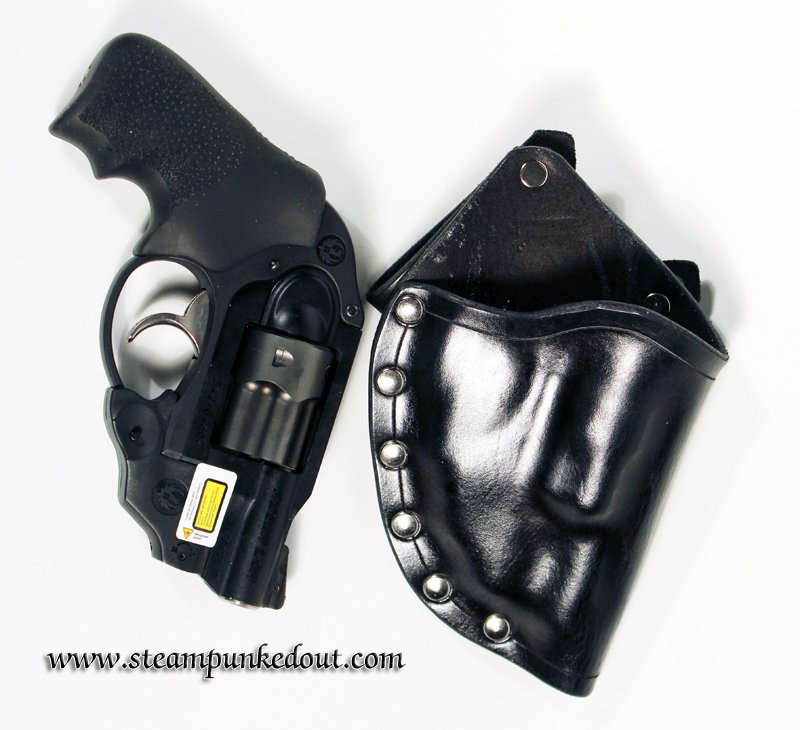 Currently, all holster designs are using little or no stitching, but are riveted together. 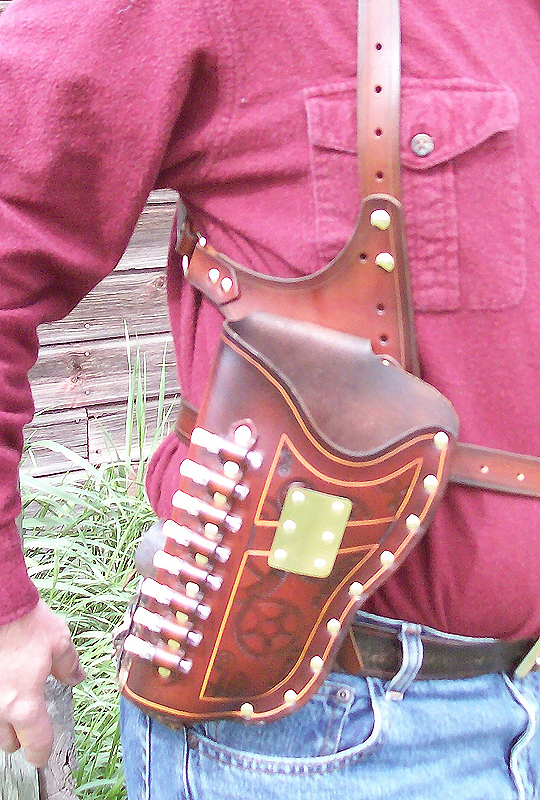 This can limit the styles of holsters available. I try not to make holster designs that require rivets on the inside of the holster, as rivets in contact with the gun can cause scratches. There are some styles where stitching is available. 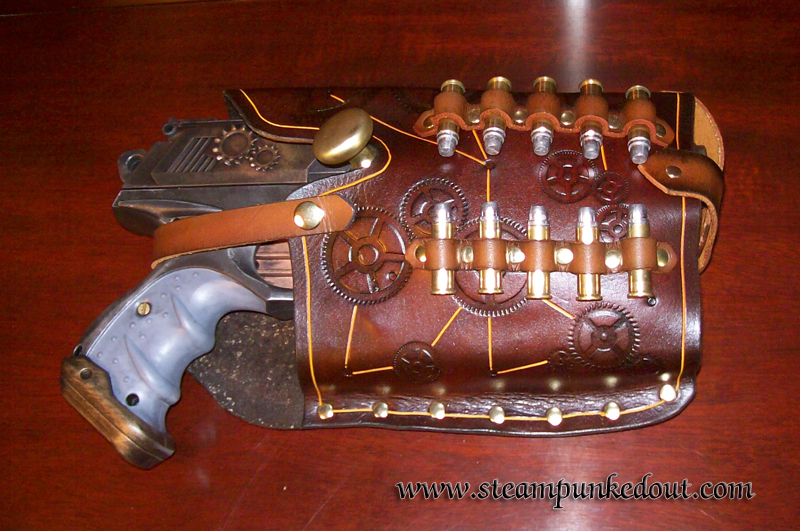 For more photos of the types of holsters available, check out the replica guns page.